IBPS PO Govt Jobs 4102 Vacancies Notification 2018: Institute of Banking Personnel Selection, popularly known as IBPS released the much-awaited notification for Bank PO Exam inviting young Graduates to undertake government jobs in Banking Sector through a Common Recruitment Process. 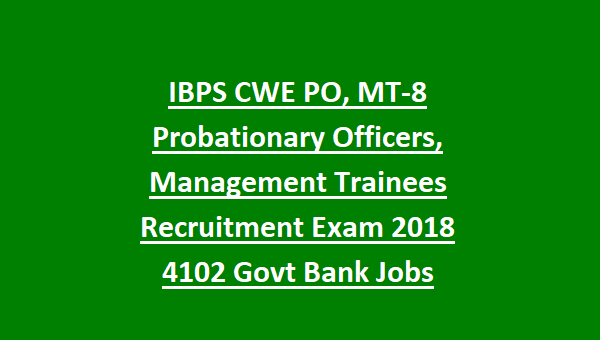 IBPS, a self-governing authority regulates the conduction of Bank PO Exam in order to recruit as many as 4102 Probationary Officers in various Public-Sector Banks/Participating Organizations. Beside Public-Sector Banks IBPS offers recruitment services to SBI, Associate Banks of SBI, RBI, NABARD, SIDBI, LIC & other Insurance companies and regular member Banks of the IBPS society. IBPS started conducting Common Written Examination (CWE) in the year 2011 to recruit officers and clerks in Public Sector Banks. It accepts application in the online mode through its official website for registration of the examination. CWE is conducted at various locations throughout India. As per the new schedule, IBPS CWE-VII PO Pre-Exam 2018 will be held on 13th, 14th, 20th and 21st October 2018 and IBPS PO Main Examination 2018 will be held on 18th November 2018. Candidates applying for IBPS PO must be a Graduate in any discipline from a recognized University/Institution. Moreover, basic knowledge of Computers is necessary and one must be able to speak & write in the regional language of the state posted. It is to be noted that an annual increment of Rs 980/- will be granted for a period of 7 years. Candidates who have successfully applied for the IBPS PO Exam will be assessed on the basis of Written Examination to be held in two stages followed by Interview of the short-listed candidates. IBPS PO Exam will be held in two phases: IBPS Preliminary Exam and IBPS Mains Exam. Preliminary Exam will be of Objective type while Mains Exam will be descriptive in nature. Unlike previous years, IBPS PO Mains Exam this year will include Objective as well as Descriptive questions. Mains Exam will consist of 155 Objective Type Questions divided into 4 sections and 2 Descriptive Questions. Candidates those who have successfully qualified the mains exam will be called for an interview carrying 100 marks. The interview round will conducted for not less than 15-20 minutes or may vary as per the demand. A panel of bank officials will assess candidates on the basis of their acquired knowledge in banking sector, current affairs, general awareness, etc. Final selection of the respective candidate will be on the basis of merit obtained due to the compilation of score in Mains Exam & Interview in the ratio of 80:20 respectively. Candidates filling the application form for IBPS PO Exam scheduled in October & November are liable to pay an application fee of Rs 600/- payable via online mode. Reserved category candidates (SC/ST/PWD) are exempted from application fee instead an intimation charge of Rs 100/- is applicable. 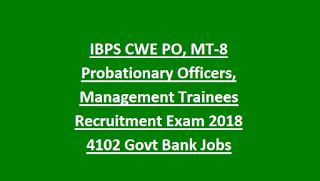 Probationary Officers (PO) /Management Trainees (MT) are recruited to various Public Bank Sectors through a Common Written Examination (CWE), known as the IBPS PO exam. IBPS PO Exam will be held in two stages out of which Preliminary Paper will be qualifying in nature for further selection process. Only after qualifying the Mains Exam, candidates are liable to appear for Interview. Following the Interview round, provisional merit list will be prepared on the basis of the preferences they filled in the application form. The responsibility to inform the qualified candidates about their joining dates and the related procedure lies with the respective banks. This year the exam pattern of IBPS MAINS is changed. IBPS has added descriptive paper in its mains exam it has 4 sections having a total score of 200 marks of 180 minutes duration and descriptive paper 1 sections having a total score of 25 marks of 30 minutes duration. This exam consists of 5 sections: Reasoning & Computer, English Language, Data Analysis & Interpretation, General Awareness, and Descriptive Test (Letter Writing &Essay). Candidates interested to contend for IBPS PO Exam can apply online through the official website http://www.ibps.in/ on or before the due date i.e. 4th September 2018. Once successfully registered, candidates can download the IBPS PO 2018 admit card from the official website http://www.ibps.in/ by logging in through the credentials provided at the time of filling application. Candidates are advised to keep following the website for updates regarding release of Admit Card. Tentative Date for release of Admit Card is September 2019. The results of IBPS will be published after successful completion of each Phase of Examination. The Final Merit List as per the state and category shall be prepared in descending order of the final marks obtained by the candidates in the Online Main Examination and interview. Merely qualifying the above criterion doesn’t ensure selection, final appointment will be based on the number of vacancies and accordingly respective number of candidates will be put through Medical Fitness Test. Even before filling the application form each candidate must be well-versed with the exam pattern & syllabus concerned with the IBPS PO Exam. Bank PO Exam analyzes a candidate’s conceptual knowledge and therefore it is important to choose the right study material and practice a wide variety of questions as well. In order to get familiar with the type of questions or topic most picked, candidates must refer the previous year question papers. Candidates are advised to go through some previous year question paper to get accustom with the exam patter and difficulty level. Last year’s IBPS Bank PO Exam saw a moderate level of difficulty. The first phase of IBPS PO Prelims 2017 was conducted all over India on 7th and 8th October 2017. As the paper was conducted online, and there was no actual access to the question paper, therefore, the given analysis is completely based on memory based questions retained by the candidates who appeared last year.